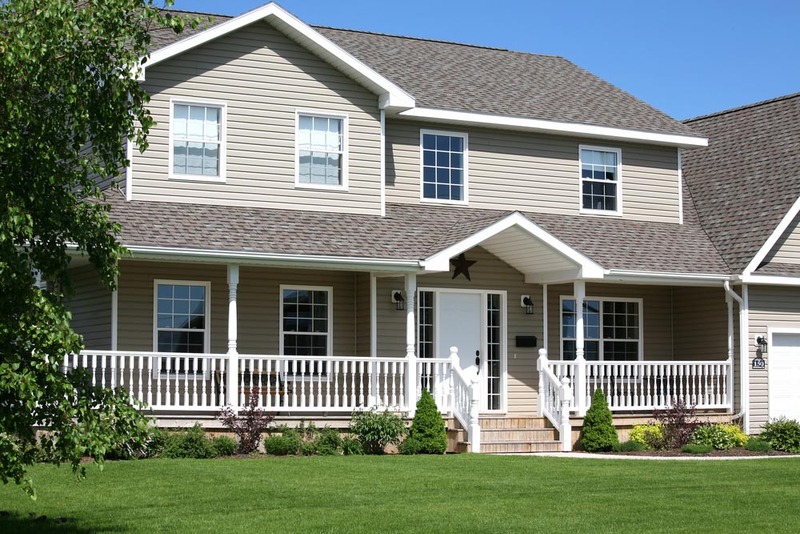 Everyone wants a nice presence to the front of their home. 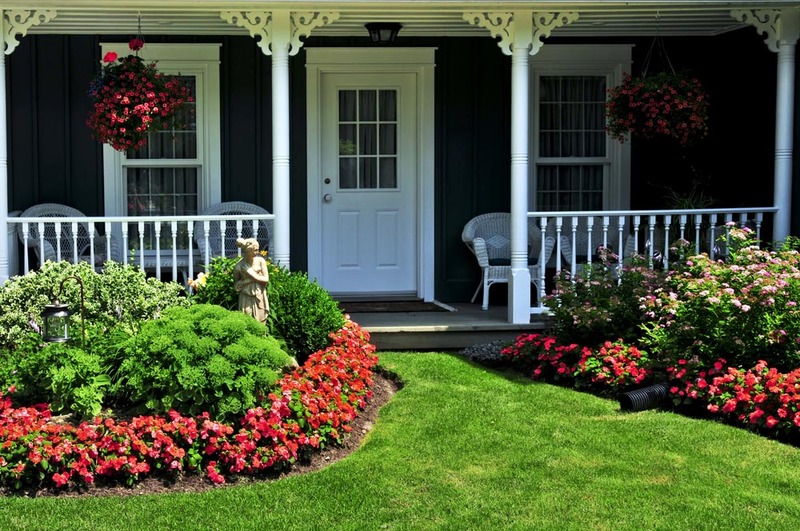 Check out these Front Yard Landscaping Ideas and revamp the look of the outside of your house. 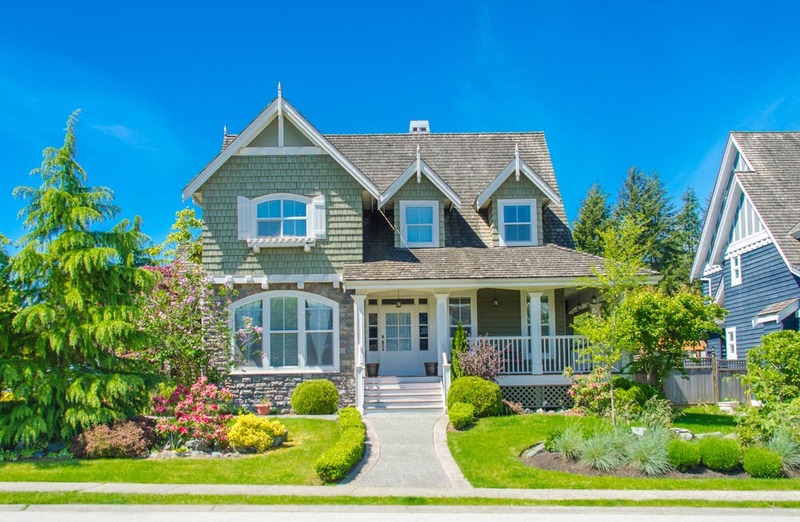 Curb appeal is an important part of home ownership, and a large part of that curb appeal is based on the landscaping visible from the street. While many of us love to garden, weed, water, and care for our plants, many homeowners may not have the time, energy, or inclination to spend their summers outside, hands in the dirt. 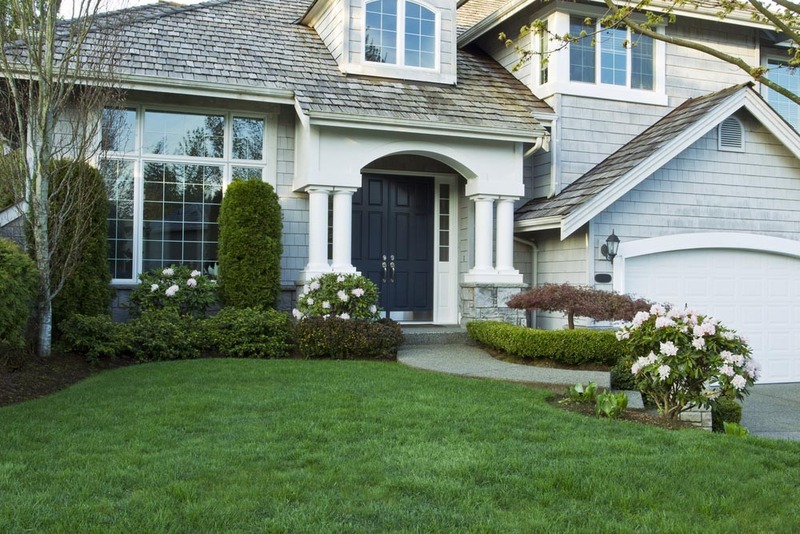 Regardless of how you feel about gardening, you’ll want to be sure that your front yard is as impressive as your home is. 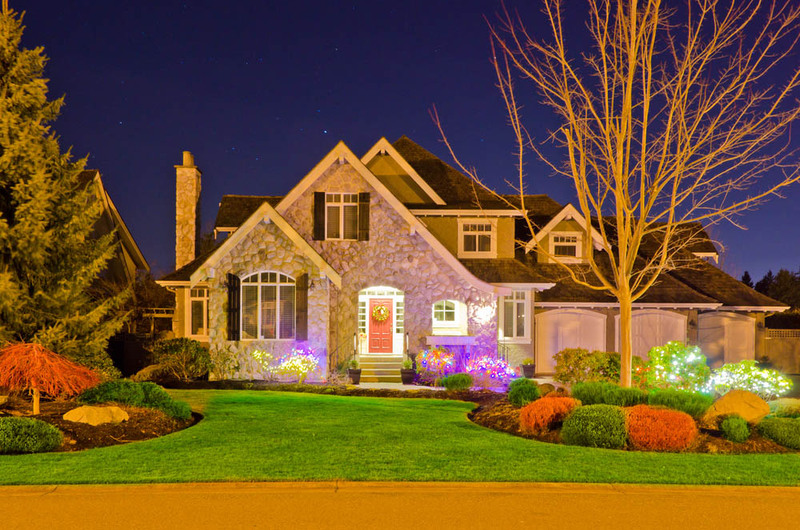 You might not be selling your home now or anytime soon, but when the time comes, you’ll be glad you spent the time upping your curb appeal. 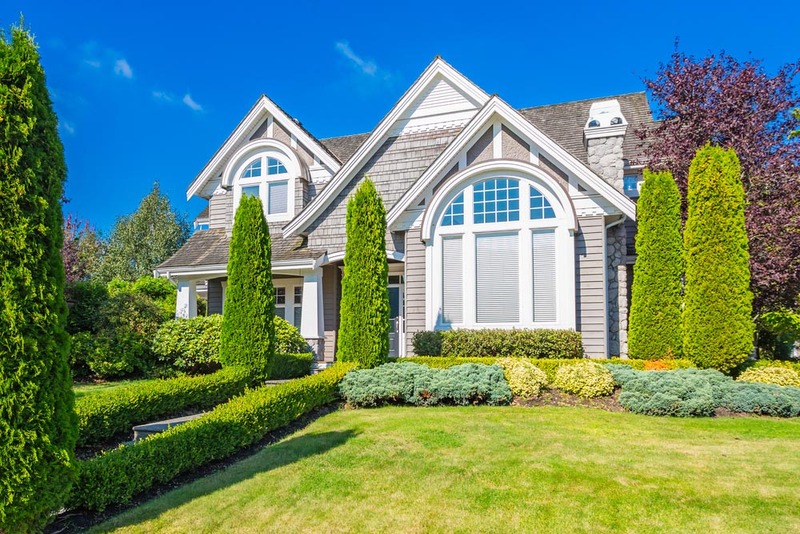 From glorious, lush gardens with absolutely no lawn to expansive lawns with a few small planting beds accenting the walkways leading up to the home, you’re sure to find the right balance of planting beds and grass. Pick easy to care for evergreens and a few perennials, or, if you have more time, pick hedges, which only require a bit of trimming. If you really love gardening, go nuts and create a cottage-style garden that’s brimming with brightly colored flowers. 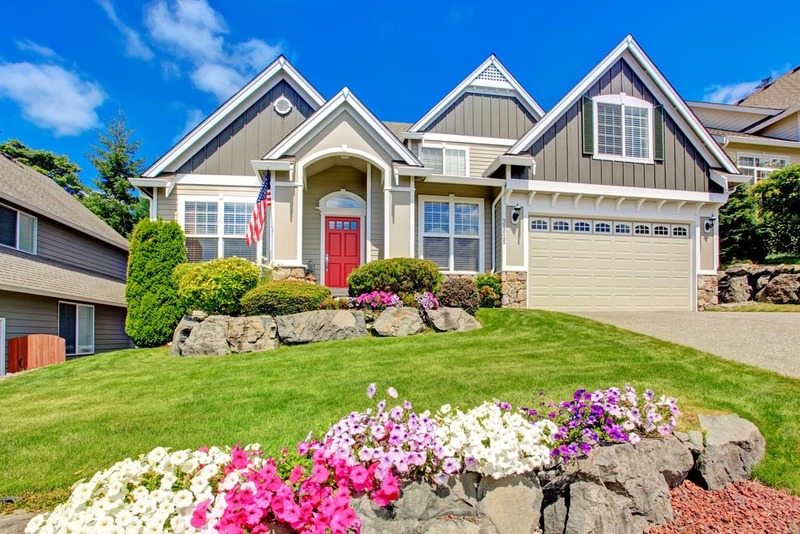 If you happen to live in a neighborhood without a lot of variety in home-style, your landscaping can really make your home stand out from the crowd. 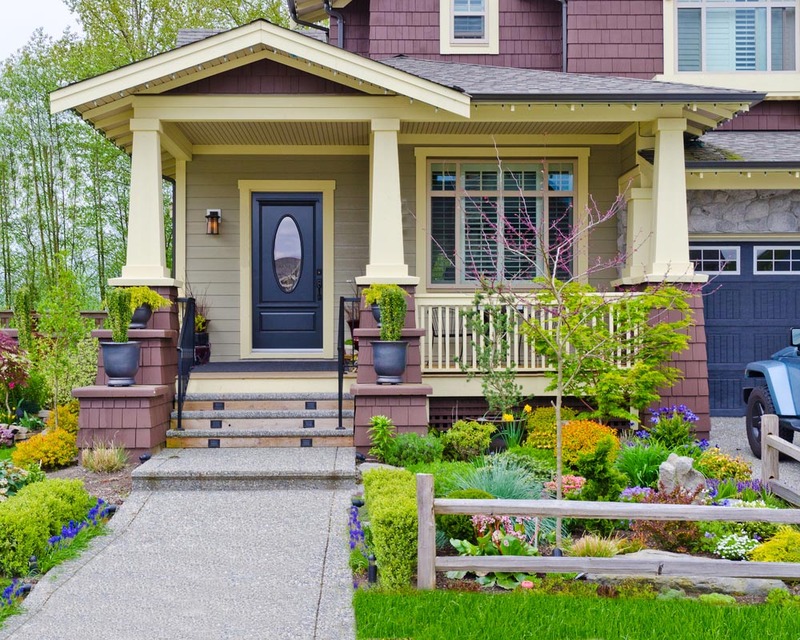 We hope you’ll be inspired by this gallery to look at your front yard and see the possibilities! A spacious corner lot in a quiet neighborhood. The lawn slopes slightly, and the planting beds match the slope, filled with low-maintenance flowers and acting as a border for the lot. To the left are several large trees that shade the home. The landscaping continues around the back of the home, effectively creating a ring of flowers and bushes around the lot. 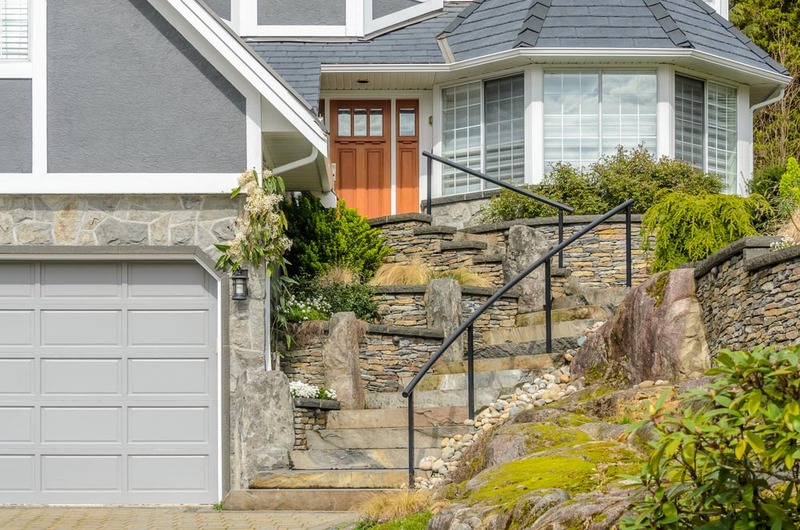 This home sits on an elevated lot and features tall manicured hedges that double as a privacy screen, in addition to a stacked stone retaining wall and an enormous evergreen tree to the left. The walkway is lined with smaller topiaries, and there are two small pink flowering bushes on the left. A lovely front yard with a small barrier between the two yards, and a concrete path moving around the side of the home to the back yard. 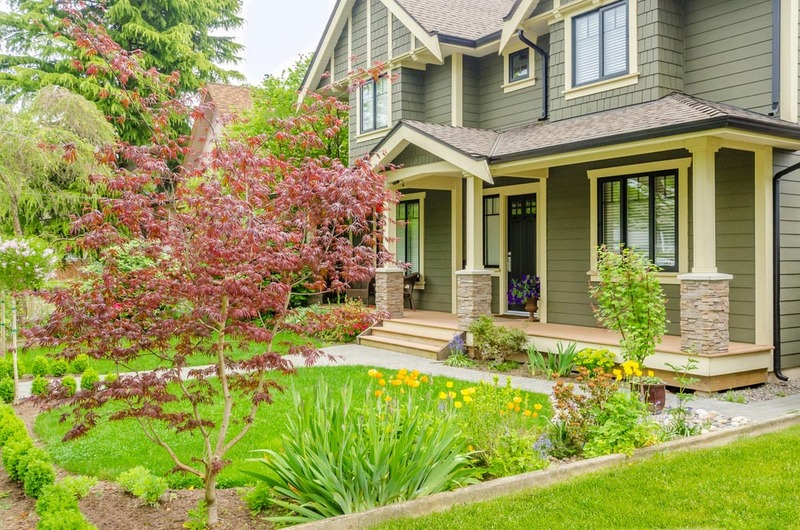 The front yard’s landscaping consists of lovely greenery, including many small topiaries, a few yellow flowers, and a large Japanese Maple. Urns filled with flowers near the front door also add color. 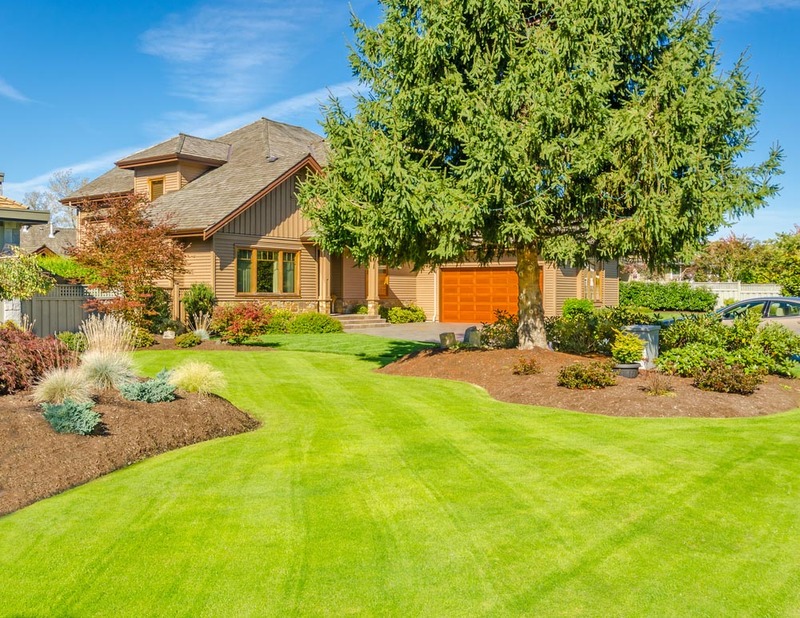 A lovely manicured, expansive front yard with large swaths turned into mounded planting beds that house a variety of low maintenance, drought-resistant plants and bushes. The subtle landscaping allows the massive pine tree in the front yard to really stand out, and obscure front of the home, adding privacy. 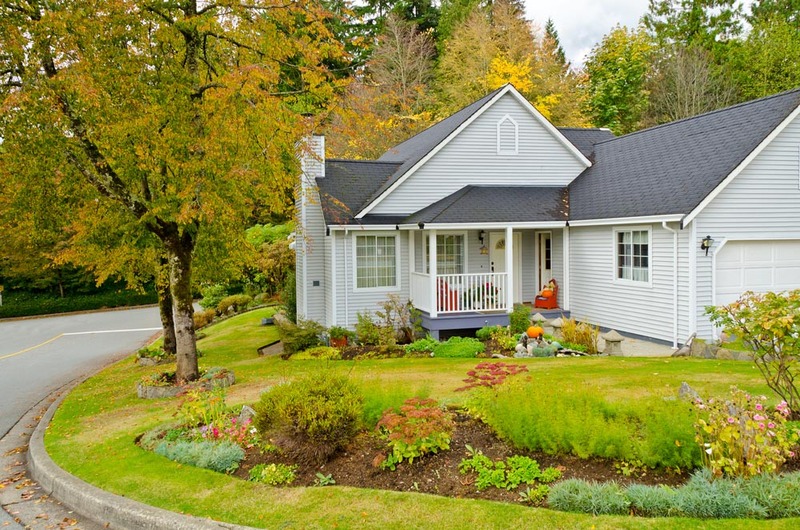 A beautiful home with fully mature landscaping, including several shade trees, a flowering tree, and a large evergreen on the left corner. 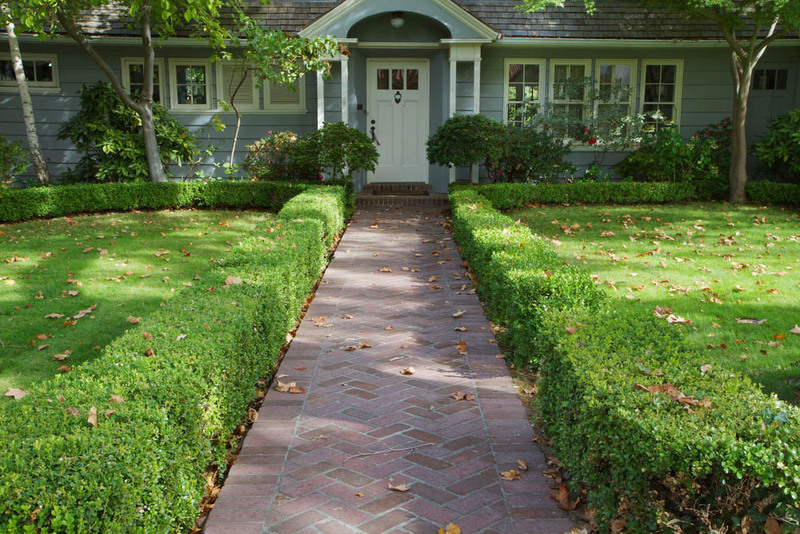 One side of the front walkway is lined with low hedges, creating a unique asymmetrical look to the yard, which mirrors the part stone, part shingle look of the quaint home. 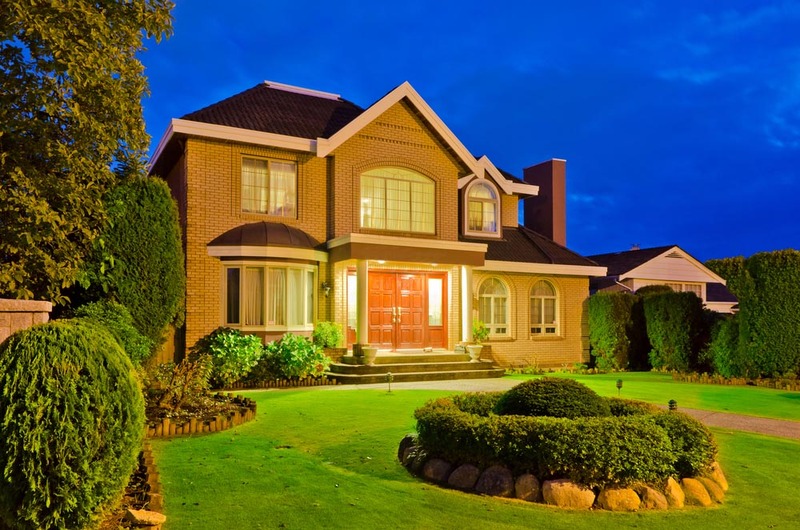 A large front yard belonging to a contemporary home in taupe. The yard has two separate landscaping displays, one of which is closer to the road and features a wealth of multi-colored petunias and large rocks. 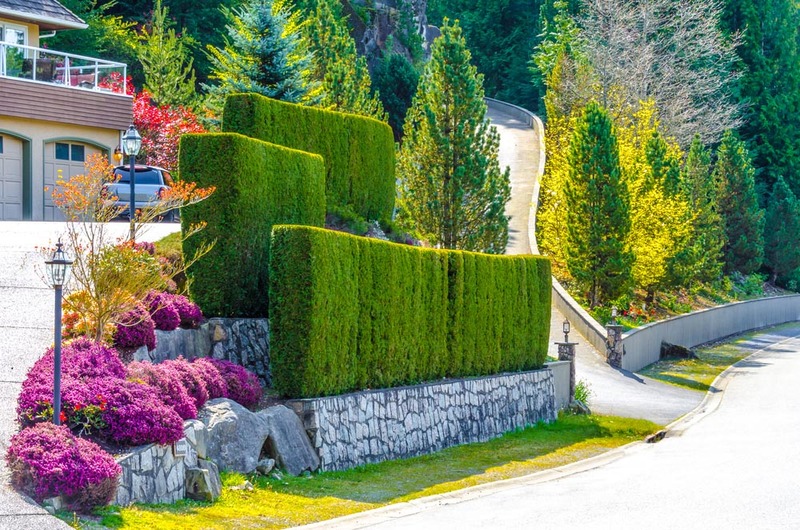 The display closer to the front of the home follows the curve of the front walkway, and features a few petunias, but namely thick bushes and topiary. 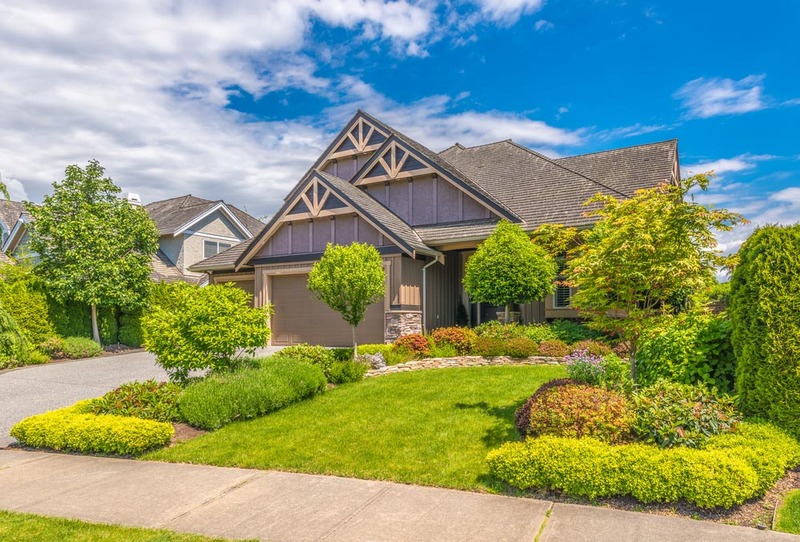 The front walkway of this beautiful two-story home is completely obscured by the lush landscaping of the front yard, which includes a wide variety of flowers and flowering bushes in reds, whites, blues, and pinks. Taller plants, like an evergreen and a flowering bush, add dimension to the landscaping design. A beautiful house on a hill with a large, manicured yard and a hedge “fence” between it and the next home’s yard. 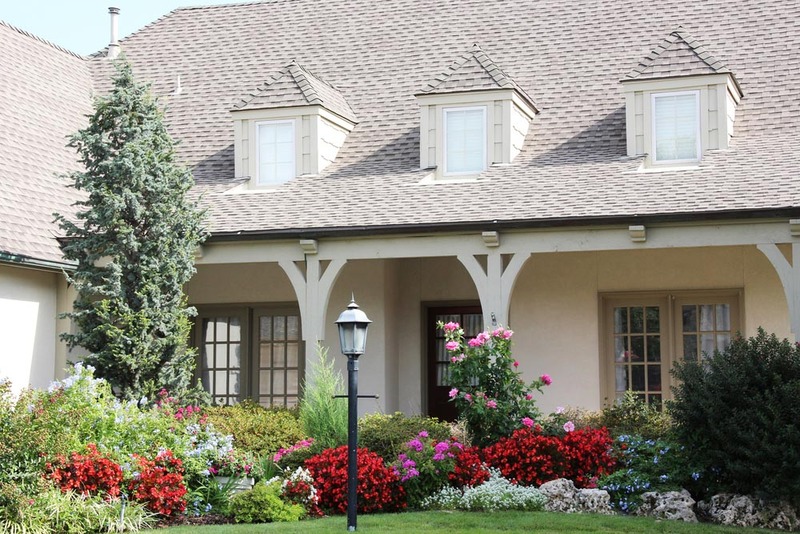 The simple, yet elegant landscaping consists of a variety of hedges, bushes, and a few hydrangea plants to add color. 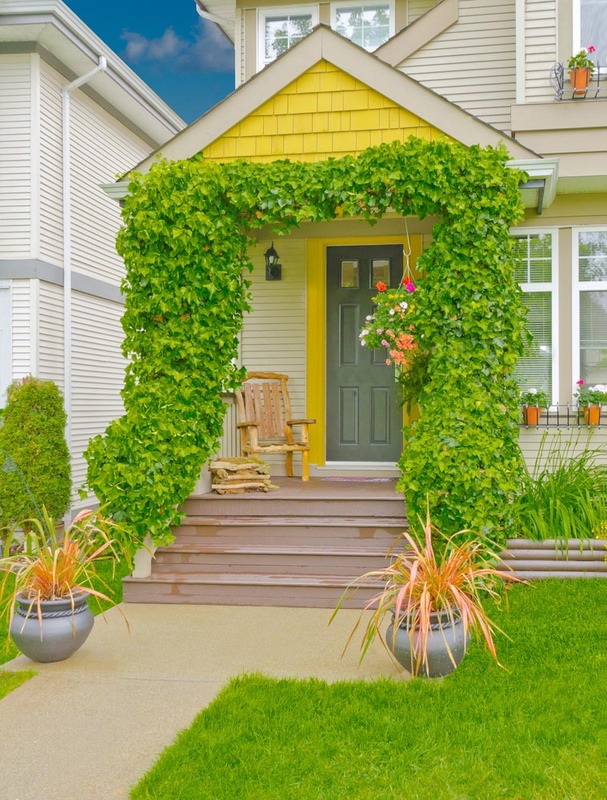 Additionally, colorful, thick hanging baskets add height and color to the design. 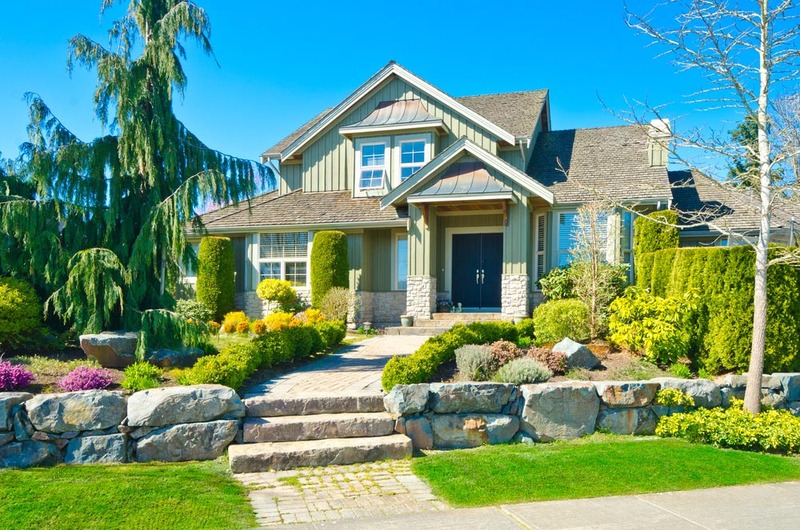 A large front yard with a lengthy planting bed that follows the curve of the front walkway. The yard is framed by bushes and round topiaries, clearly defining the boundaries of the home. Nearer to the road, a few young trees add dimension to the yard, and will eventually become large shade trees that preserve the privacy of the home. A beautiful, stately home with large arched windows and landscaping to match. The landscaping is simple, but elegant, due to the addition of large topiary pillars at strategic points throughout the yard. Simple, but easy to care for–and the landscaping will look great all year long! 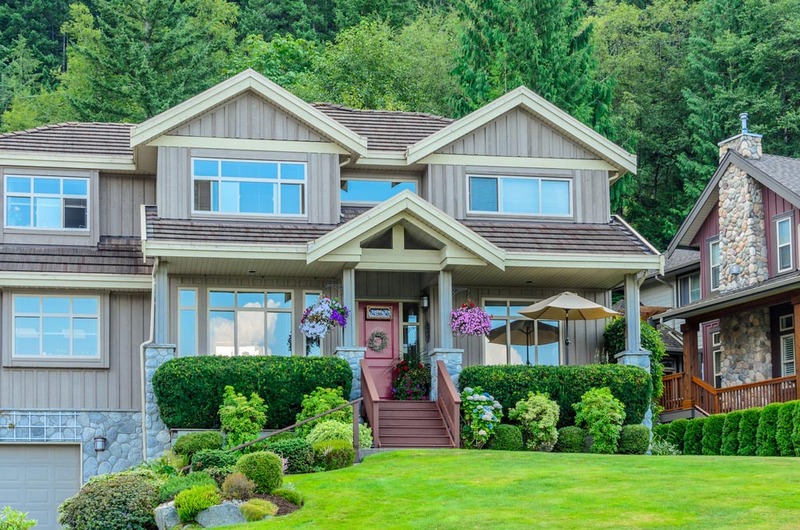 A lovely, well designed front yard with lots of greenery. 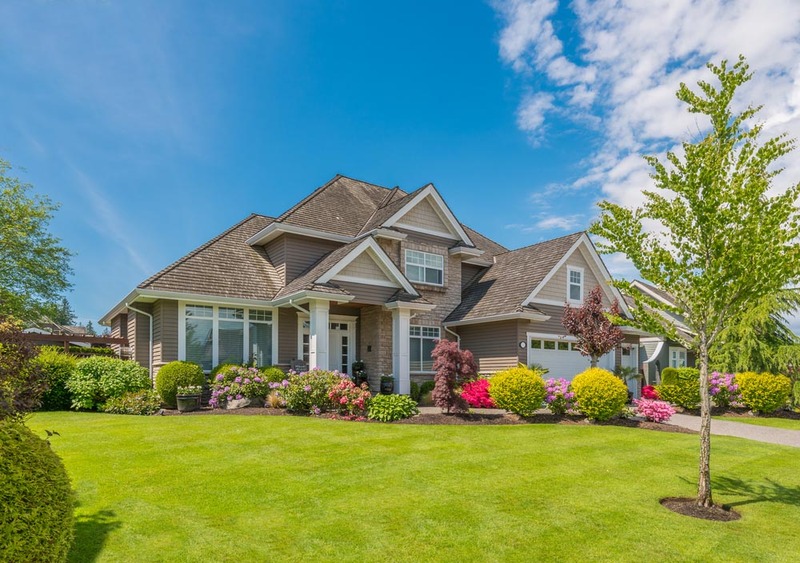 The combination of thick planting beds rife with ornamental trees, flowering bushes, and short hedges results in a lush yard with only a bit of lawn to mow. Hedges run along the length of the yard, acting as a fence and privacy barrier that blends in with the rest of the landscaping. This is a lovely example of landscaping that doesn’t rely heavily on flowers. The front yard is hilly and unsuitable for large planting, so the owners substituted mossy stones and a few evergreens, each located on one of the many steps of the path up to the entrance. The result is the perfect mix of greenery and stone architecture. This particular home also has a very little yard, due to the location on a steep hill, but what little bit they had, they took advantage of. The yard has three tiers of retaining walls, each topped with manicured hedge walls, which effectively shield the front of the home from view. To the left of the hedge, walls are a bundle of bright fuchsia flowering bushes and a few ornamental trees that follow the lamp posts up the driveway.